Lamborghini made motorsport history yesterday as it won its first ever IMSA title with the Huracán GT3 driven by Bryan Sellers, Madison Snow and Corey Lewis sealing the “GT Daytona” championship in some style after finishing on the podium in the famous Petit Le Mans. Lamborghini made motorsport history yesterday as it won its first ever IMSA title with the Huracán GT3 driven by Bryan Sellers, Madison Snow and Corey Lewis sealing the “GT Daytona” class championship in some style after finishing on the podium in the famous Petit Le Mans. Anticipation to see who would take the title had been building since early September as the IMSA WeatherTech SportsCar Championship’s “GT Daytona” (“GTD”) class was set to come down to a straight fight between the #48 Lamborghini Huracán GT3 and its Acura NSX rival at Petit Le Mans, held as usual on the 12-turn, 4.09 km Road Atlanta circuit tucked into the North Georgia hills. 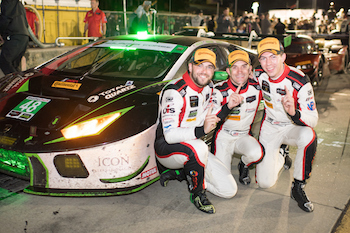 At the end of the gruelling 10-hour race, the Paul Miller-entered Lamborghini piloted by Sellers and Snow, joined in the cockpit by their endurance race teammate, Lewis, accomplished what they set out to do – take home the first-ever IMSA championship for their team owner and for Lamborghini. The trio piloted the Huracán to a third-place finish, one spot behind the #86 Acura and that was good enough to finish the season with a four-point advantage at the end of the eleven-race season; the final standings being 333 points for the Lamborghini and 329 points for the Acura. Winning the championship was a first for Paul Miller Racing after the team had come close to clinching this title as they had finished on the season in the top three on three occasions in the last four years. Meanwhile, Lamborghini won the class manufacturers’ title over Acura by 12 points, the final score being 345 points to the Italian brand and 333 points for its Japanese rival. 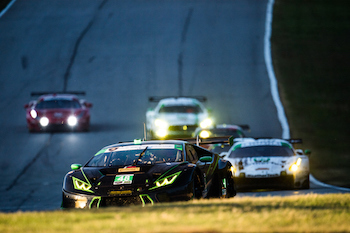 The gap was a mere seven points entering Saturday’s race with the Lamborghini duo of Sellers and Snow holding the lead over Katherine Legge in the Acura. The chase for the championship had an extra ingredient of intrigue as the two cars started next to each other after they were separated by less than two-tenths of a second following qualifying. As the green flag fell, the #48, who has held the class lead for the last nine races, quickly moved to the front of the GTD field while the #86 soon fell off the pace. Things got interesting at the mid-point of the race as Legge’s co-driver, Alvaro Parente, closed to second place behind Snow in the #86. Following a series of pit stops over the next few hours, the teams swapped places within the top four of the class. With around two hours remaining, Sellers climbed in the car and guided it back to the top of the class. During that time, the Acura once again fell off the pace, running anywhere from fourth to sixth. As the race entered its final stages, Sellers found himself in third place, and one spot behind the Acura and that is how the race ended to give the team the championship. It was the second endurance race victory for the trio in 2018 as they also won the 12 Hours of Sebring back in March. 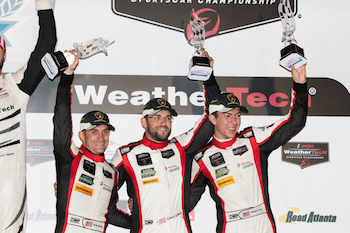 The victory was the team’s third in eleven races as well as the eighth podium of the year. Madison Snow: “We ended the race with our hands full of trophies and champagne so that’s a pretty good way to end the race. We were third in the race, but first in the championship. So that’s the big thing for us. We knew the 86 was on us all season, and it was all about consistency. Being up there and being in the fight. Paul Miller brought us a car every single weekend and every single track and that’s what got us here today.